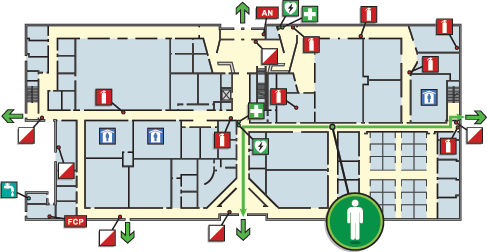 Pictographix - Building evacuation maps, evacuation plan displays and office and workplace evacuation maps by Pictographix. We provide custom building evacuation graphic development and the largest selection of evacuation map prints and framing options. Sign products are available to meet any environmental or aesthetic requirement. Free quotes and consultation provided within 24 hours. Start Your Evacuation Map Project Now! Prints to Metal, Acrylic, PVC. We offer a wide selection of sign displays for posting your evacuation maps and safety signs. Displays include institutional aluminum sign casements and digital print services to acrylic and aluminum or PVC — perfect for those who have print-ready artwork and require quality prints. Browse Frames and Printing Options Now! Our EvacGlow site is dedicated to photoluminescent products. 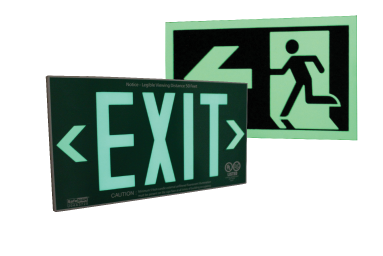 We offer UL 924 and UL 1994 listed photoluminescent exit signs, path markers and stairway signage. 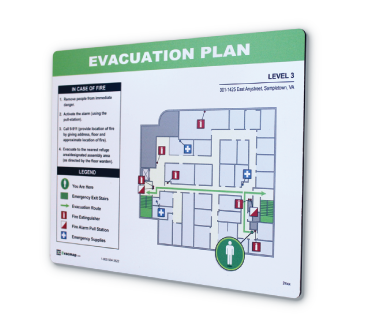 High-glow photoluminescent sign holders and frames allow your evacuation maps to glow-in-the-dark following a power failure. Inquire About Photoluminescent Safety Products Now! 20 years of experience behind every project! Having serviced thousands of satisfied clients across the U.S. and Canada, we know a thing or two about code compliant evacuation maps. Custom diagrams to meet your local code requirements. Displays to suite every budget and project. Diagrams archived for future revisions. Download printable diagrams from our secure server. “Great service and very detailed artwork. On your next Evacuation Map Project!